This topic contains 23 replies, has 15 voices, and was last updated by clem 6 months ago. Sci-fi and fantasy special of Pointless Celebrities airs on BBC One next Saturday (the 18th) at 6pm. Rather good line-up: Hannah Waddingham and Gemma Whelan off of Game of Thrones, Jeff Rawle and Chris Rankin off of Harry Potter, David Dixon and Sandra Dickinson off of Hitchhiker’s Guide to the Galaxy, and Norman Lovett and Hattie Hayridge off of Red Dwarf. Hopefully it’ll be better than the ‘Goitless’ that was done at the 2013 Dimension Jump. First post should of course read ***m** ****t*. Apologies. Ian, that was a compliment. Seriously, I thought the Goitless was great but if Pointless can top that then that would be amazing to see. Sorry, didn’t mean to cause any offence. I always start my compliments with “hopefully it will be better than…”. All those people that said “hopefully Mechocracy/M-Corp/Skipper is better than Timewave” were really just giving Timewave the highest possible praise. If a combined IQ of 12,000 can’t win, nobody can. Hopefully Skipper will be better than M-Corp. The BBC is one person. It’s very important to equate BBC commissioning policy of the early 2000s with choice of quiz show guest stars in 2017. I may or may not be doing both of those things. I thought every single decision made by the BBC was signed off on by Micheal Grade, like how The Queen signs all the laws. What chance a G&T banner with this image? It’s slightly chilling the way the eyes follow you around the room. You see a picture like that, and then wonder why Norm looked about 108 in Skipper. It’s like they tried really hard to make him look 40 again, which is an impossibility, so they just ended up with some monstrosity of makeup thicker than a ticket tour’s wad. I hope there are several minutes devoted to explaining it on the dvd. Also, what a nice picture. I forgot this was happening. They would have been well within their rights to stick a pixel filter over Norm, accurate for the universe. Pre accident. I was staggered how long ago this was filmed. From what Norm was saying, XI hadn’t even been broadcast by that point. It’s the grading rather than the makeup that makes him look so weird in Skipper I worked out. There are contouring illusions on his face which would have looked fine in more natural lighting and post-production, but it’s the high contrast and the stripping out of the red tones that leave him looking like a scrotum sat on a flatbed scanner. I saw Miles Jupp at a gig over a year ago and he was talking about an episode of Pointless Celebrities he’d done a few months previously that was yet to air, so they’re definitely sitting on a lot of these. I suppose it’s because they’re done as part of the regular series and not as a separate unit. 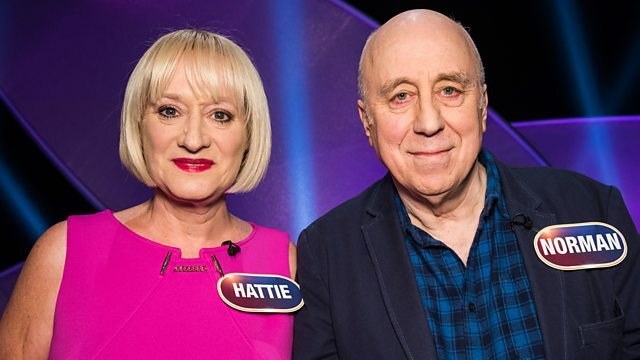 Just noticed on the EPG that Hattie’s on another sci-fi edition of Pointless Celebrities next Saturday, also featuring Jessie Cave, Peter Davison, Katy Manning, Paul Darrow, Michael Keating, Kiran Shah and Jimmy Vee. Let’s hope she does better without Norm.